A deep ruby color, aromas that suggest pronounced fruitiness and elements of spice, leather, smoke and talk about the potential of wine and a perfect fit. The only way to describe this wine is by using the word “muscular” but meant in a positive way. Intriguing aromas, seems to show the meatiness of Merlot but also the rawer meat characters of Syrah. Very fresh acidity, great flavour; firm but balanced tannins. Magnificent. It is necessary to decant the wine which is best served in Bordeaux stlye glass. With a lifetime’s love of great wine, particularly the wines of the Rhône Valley, as well as a passion for the terroir of his native Istria, Mladen Rožanić searched for a long time to find the right terrain on which to plant his vines according to the extensive knowledge he had acquired as he travelled and learned from great winegrowers around the world. Subsequently 26 hectares of vineyards were planted over a four-year period in west Istria near Višnjan, an ideal region for Mladen’s purposes, thanks to its superb climactic and geological conditions. Roxanich produces natural wines from both indigenous and internationally recognised grape varieties all in line with the highest ecological standards, cultivating the grapes using traditional methods with crop control and minimum intervention. In the winery, mechanical and chemical intervention is excluded. Grapes are stored in specially shaped barrels, aged wooden vats of 55 to 75 hl capacity, where maceration and fermentation take place. After pressing and first decanting, the wine is re-stored in these same vats as well as 38 hl casks where it is kept to age for three years. These wines are characterised by long skin contact which varies from vintage to vintage – 4 to 6 weeks for the reds, and for the whites from 8 days for the Chardonnay up to 174 days for both Malvazija Antica and the brand new cuvée ‘Ines in White’ named after Mladen’s wife Ines. Rich aromas, extraordinary colours and full-bodied flavours give these wines their truly unique personalities. 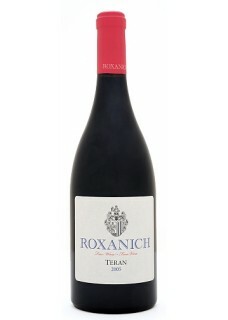 From the first 2005 vintages that came out of the cellar in 2008, Roxanich’s natural wines have been enjoying wide success worldwide.